Have you ever wondered why you have set the VIEWRES in one drawing and then when you open another drawing, it has changed even though you may have changed it using the OPTIONS dialog box? There are some settings that are only saved in the current drawing and then there are others that are saved to the “registry” that will take effect in the next drawing that you open. 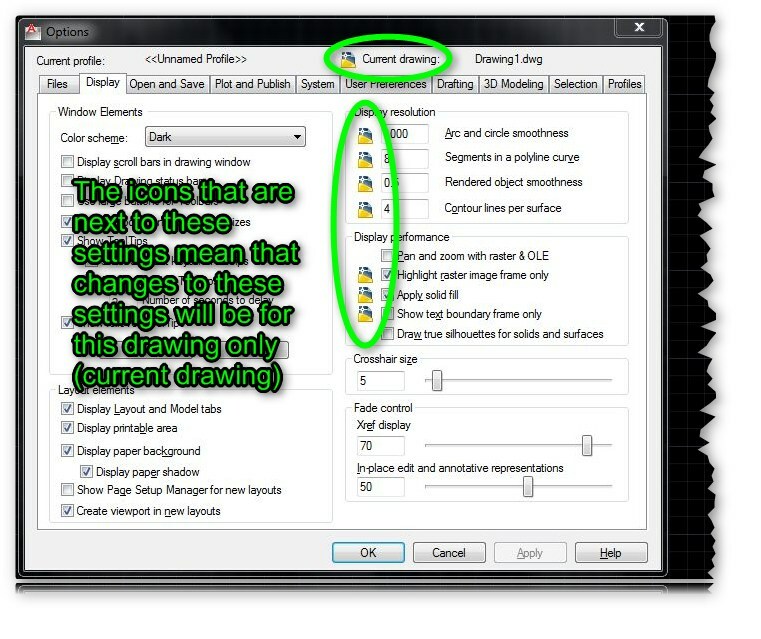 If you want any of these “current drawing” settings to be set for you automatically, this is where saving your drawing as a template (.dwt) is very helpful. This entry was posted in BASICS, Customization, Settling In, TIPS. Bookmark the permalink. Thanks for sharing your knowledge. However, my question is: Is there any way all these changes be applied to every drawings I opened without reconfiguring all these parameters according to my preference? Thanks a lot.